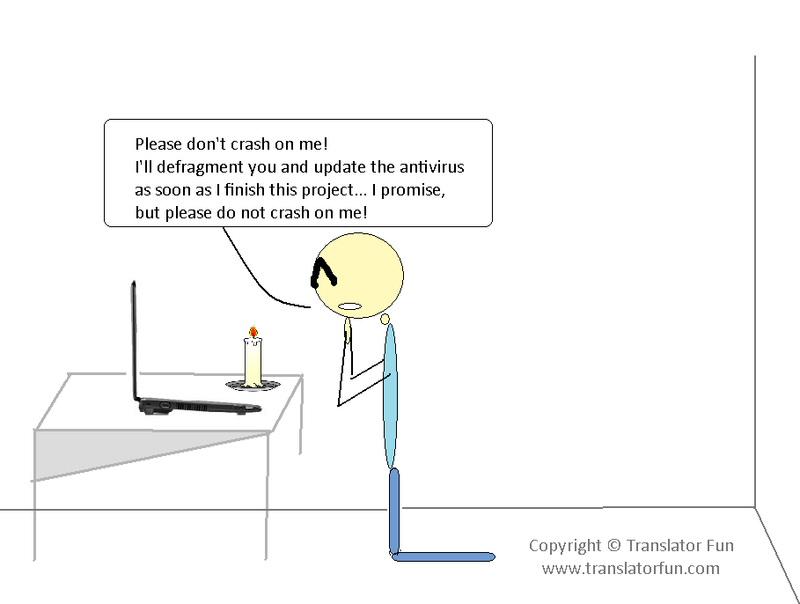 Translator’s promises — don’t crash on me! Does this scene sound familiar to you? Do you make promises to your computer? But, most importantly, do you keep them? Please post here the promises you’ve made to your “poor” PC/laptop and if they’ve worked. Translator’s lifestyle series — let go of it now! This entry was posted in Best practices, Freelance translator, Fun, lifestyle, Translation and tagged best practices, computer, Hardware, maintenance, Notebooks and Laptops, systems, translation, translators by Romina Bona. Bookmark the permalink. Once upon a time, I promised that I would install a decent operating system to my computer. And I installed openSUSE Linux (it was 10.2 then, now it’s 11.3/11.4 on different computers). And I did not have to promise anything else, because the computer just works. No crashes, no viruses/trojans. Just boring work.